I just love hearts..... I can't get enough of them. I can't get enough of watercolors either, so this project is a perfect combination of both of these loves! Add some stripes to these two and you get a fun art project for Valentine's Day. 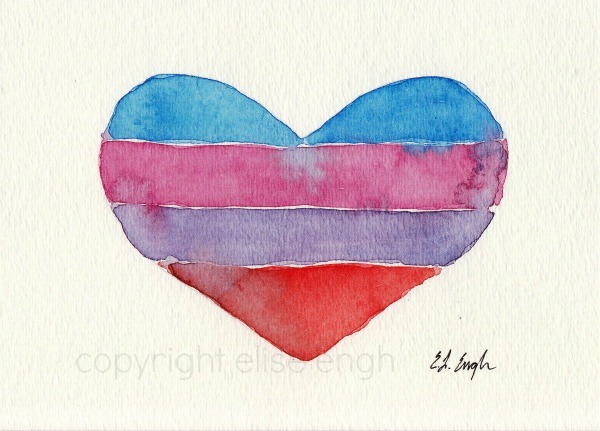 You can use this as a framed piece or on some cards for your loved ones. 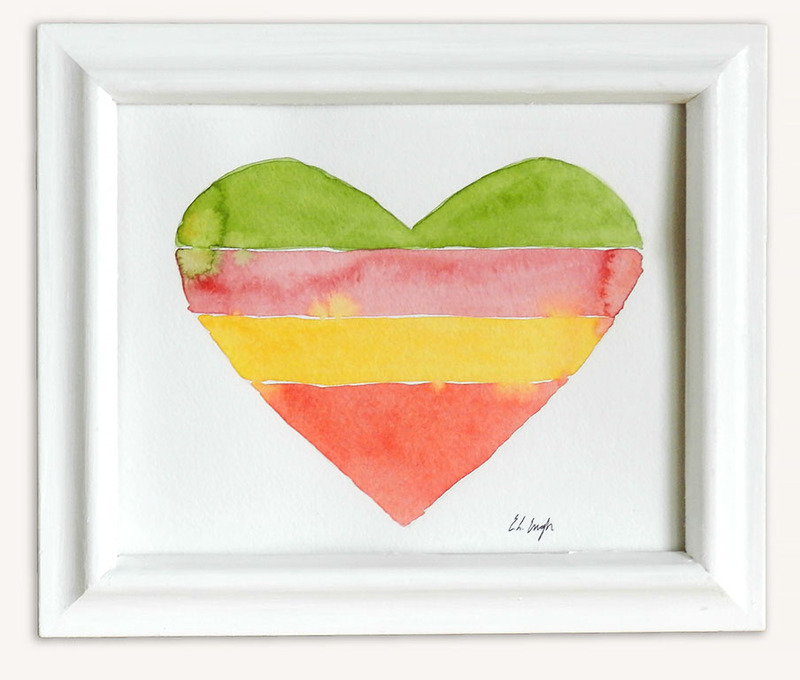 Here's my simple tutorial for making your very own unique Watercolor Valentine's Heart Art. 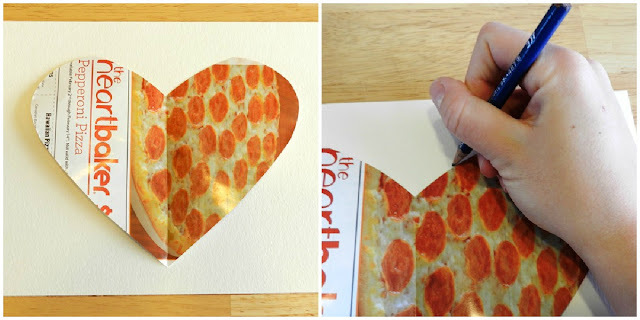 Step 1: Cut out a heart shape to use as a stencil out of scrap paper or cardboard. 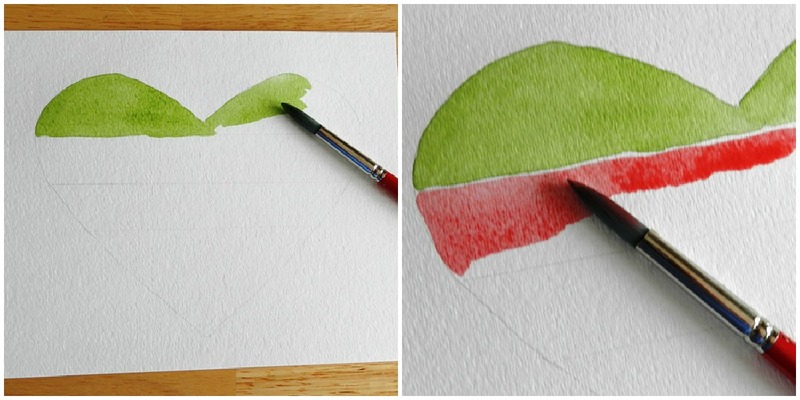 Or if you happen to have them, use a stencil or cookie cutter to fit the size of your watercolor paper. Step 2: Place your heart stencil on the center of your watercolor paper and lightly trace the outline in pencil. Step 3: Using a ruler, lightly draw horizontal lines across your heart drawing to create sections. You can draw as many lines as you would like, but I think it looks nice with four sections. Step 4: Pick out four colors (or as many as you need to fill the sections you drew) to fill in your heart. If you are mixing colors, make sure you mix enough to fill an entire section. Step 5: With the color of your choice, paint in the top section of your heart drawing. Then, fill in the other sections below it with different colors leaving a small space between the sections. Tip: If you want your lines to be clean and distinct, wait for each section to dry before painting the next section below it. Personally, I like it when the paint mixes a little between the sections, so I painted one right after another without letting them dry first. Step 6: Let your heart painting dry and don't forget to sign your masterpiece! These would make some cute cards...... Hmmm...... maybe I'll do that next year. I've already made cards for this year. Yup, I'm going to do this! Absolutely, darling. It's so simple but really lovely! I love the simple beauty of this. Gorgeous. I hope you will add this and any other posts you're proud of to my link party! Very pretty--and so simple, too--nice! even my super unsteady hand could pull this off! I think this will have to be a framed card for my valentine! These hearts are gorgeous! They're simple yet so beautiful and make a great statement. I'd be thrilled if you'd link up at Off the Hook! great idea to use to make your own art to display or to use as a background in an art journal! I've been wanting to get into watercolors for a while now and this makes the want even greater! Love it! gosh, i'm just so in love with your blog. you are SO talented.